» Previous Article: New Destinations in Mexico! Hmmm...colonial charm? Or sun and sea? 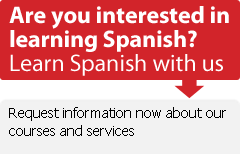 Learn Spanish while reading Spanish language blogs... or writing one! If you're truly committed, you might want to try your hand at writing one… or perhaps a bilingual blog, for other students of Spanish in your country? You can set up your own Spanish language blog at Bitácoras.com. Blogger offers a full (free) Spanish language blogging interface, as well. Bitácoras offers a list of the 500 Best Blogs in Spanish. The same site also keeps a great archive of interviews with Spanish language bloggers. Here you'll find one blogger's ranking of the 100 best blogs in Spanish. And on the offical page of the Bobs (best of the blogs) you'll find a nifty tool you can use to search for blogs by language and topic. I might have to try that with my students. They're on the computer all the time anyway. It is true that by having to write, you can test your own knowledge of the language and notice your weaknesses. Exactly, Sandy! Plus they'll likely pick up colloquialisms, and can practice by leaving comments in Spanish!